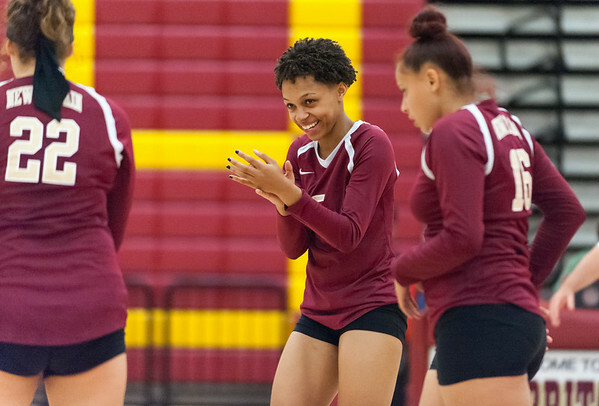 NEW BRITAIN - The area girls volleyball teams can now get ready for the postseason. The CIAC released the brackets for the state volleyball tournaments Friday and the 10 New Britain and Bristol area teams that qualified learned their seeding and who they will be taking on in the first round. In Class S, St. Paul qualified with a 16-4 record, earning the fifth seed. The Falcons will host No. 28 University (8-11) on Monday at 4:30 p.m. If the Falcons win the match, they would then see the winner of No. 12 Morgan (11-7) and No. 21 Immaculate (10-10) on Wednesday for the second round. Also qualifying in Class S was Goodwin Tech. The Gladiators are the 13th seed with a record of 12-8. Goodwin Tech will host No. 20 Wheeler (10-0) Monday at 5 p.m. The final team to qualify in the Class S bracket was Terryville. With an 8-10 record the Kangaroos earned the 27th spot in the tournament. Terryville will travel to No. 6 Whitney Tech (16-4) on Monday for a 5 p.m. start. Over in Class M, another pair of local teams found out their first round opponents. Berlin earned the 15th seed with its 13-7 record and will host No. 18 Weston (12-8) in the first round. If the Redcoats win their match, they will travel to second-seeded Bullard Havens (19-1) on Wednesday. Innovation earned a first-round bye with a record of 17-3. The Ravens are the fourth seed in Class M and won’t start tournament play until Wednesday. Innovation will host the winner of the 13th-ranked Montville (14-6) and No. 20 Amistad (8-7) at 6 p.m. The Class L bracket also features a couple local teams. Bristol Eastern earned a first-round bye with its 15-2 record. The Lancers are the No. 4 seed and will not begin tournament play until Wednesday. Bristol Eastern will face the winner of the 13th-ranked Farmington (13-5) and No. 20 Hartford Public (12-8) match. Also qualifying in Class L is Bristol Central. With their 16-3 record the Rams have earned the ninth seed and will host No. 24 Sacred Heart Academy (9-11) Monday evening at 6 p.m. If Bristol Central beats Sacred Heart, it will then continue on to the second round for a matchup against No. 8 East Lyme (16-3). The final team to qualify in Class L is Newington. The Indians finished the season with a 14-6 record earned the 14th spot in the bracket. Newington will host No. 19 Fitch (11-7) on Monday at 5:30 p.m. The Class LL bracket features two local teams. Southington, with its 18-0 record, earned the top seed, which gives them a first-round bye. The Blue Knights will wait until Wednesday to play their first tournament game and will host the winner of the matchup between 16th-seeded South Windsor (12-8) and 17th-seeded Staples (11-8). Elsewhere in Class LL is New Britain, which received the No. 9 seed with its 15-5 record. The Hurricanes will host No. 24 Fairfield Warde (9-11) at 6 p.m. If New Britain pulls the pulls out the win, it will face the winner of No. 8 Conard (15-4)/ No. 25 Simsbury (8-10). Posted in New Britain Herald, Berlin, Goodwin Tech, Innovation, New Britain, Newington, Southington on Friday, 2 November 2018 22:30. Updated: Friday, 2 November 2018 22:32.